These chilli lime sweet potato wedges are the best way to stay on track when you want to snack healthy! Crispy edges, soft creamy inside and a definite tasty kick from the chilli lime seasoning, these wedges will guaranteed disappear in minutes. Use this recipe for potato wedges as a base, and add any seasoning you like. Snacking is top of my list when it comes to eating. And I believe snacking shouldn’t be boring. Which is why these addictive chilli lime sweet potato wedges fit right in. They are crispy, oven baked to perfection and have a fantastic balance of sweet, spicy and tart. The only drawback is how fast they finish and how often you’ll have to make them! But this recipe beats a pack of chips hands down. The first step to making these is to cut your sweet potato into wedges. I like to keep the skin on because it has so much fiber that it’ll be a shame to throw it away. And because it crisps up in the oven and the seasoning really clings to it. If you are not a fan, feel free to peel it before you cut your sweet potato. Sweet Potato is fairly easy to cut and I recommend using medium sized sweet potatoes for this recipe. I like to use a large knife because it gives me the length and breadth to cut through quickly. 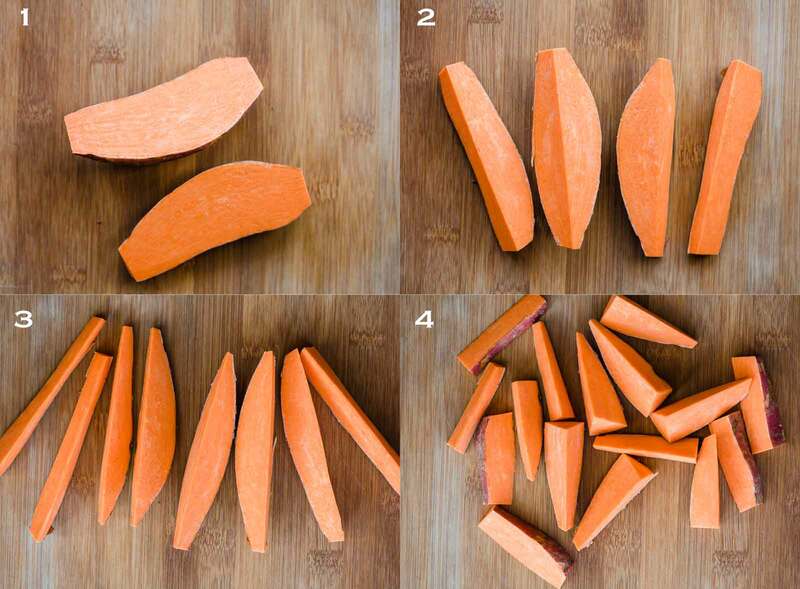 Here are step by step pictures to show you how to cut the sweet potato into wedges. I start by snipping off both ends and cutting the sweet potato in half lengthwise. Each half is then cut into two parts till you have four thick wedges. Now cut along the pointy end of each large wedge, which will give you eight long wedges. I like to cut these in half till I have sixteen wedges that are easy to pick and eat. Honestly, which variety of sweet potato you use to make these chilli lime sweet potato wedges is really based on whats easily available to you. But having tried this recipe with both, I prefer the orange variety because they are firmer, and taste better for this recipe. They also generally have a thicker middle, which makes them perfect for wedges. Since these are baked and not fried, its the secret ingredient in this recipe that keeps the outside crisp, makes the seasoning stick to it and basically makes these awesome without the deep frying. That ingredient is starch. Any kind of starch will do – tapioca flour, cornstarch, potato starch etc. I’ve used potato starch in this recipe and it makes a huge difference to the end product. The trick is to coat these wedges in starch first so that it clings to the wedges well, and doesn’t become lumpy, and then toss these in seasoning and oil. But what really makes these sweet potato wedges such a hit is the seasoning. It’s a heady mix of smoked paprika, lime zest and juice. Three simple ingredients along with salt and olive oil and you’ve got every flavour out there – the sweetness from the potatoes, the spicy kick from the paprika and the tartness from the lime. Balanced but addictive! Lets just say – I don’t believe in boring snacking! Baked chilli lime sweet potato wedges are the perfect healthy snack. These are oven roasted with crispy edges and soft, creamy centre. Turn these into sweet potato nachos or dip these wedges into a dipping sauce – either way you’ll love these! Gluten free, vegan and super easy to make! Pre-heat the oven to 220 C/430 F. Place a baking rack on a baking sheet and set aside. Snip off the ends of each sweet potato (leaving the skin on), and then cut them into half lengthwise. Cut each half into two more parts lengthwise, and then further into two more till you have eight long wedges. Cut each long wedge in the middle to make 16 wedges from each sweet potato. (Scroll up to see step by step pictures to cut sweet potato into wedges). Toss the sweet potatoes well in potato starch till the wedges are coated evenly. Then sprinkle paprika, lime zest, lime juice, salt and olive oil over the wedges and use your hands to toss the wedges in the seasoning. Arrange them on the baking rack and bake for 35 minutes. Turn on the broiler (or the top element of the oven) for the last five minutes to get them extra crispy. Sprinkle them with some flaky sea salt and serve immediately. How do you make these in a microwave? Sorry I’ve never made these in the microwave so I can’t help you there. I really recommend the oven for these sweet potato wedges, because those crispy edges are the best. The way you have explained this – who doesnt love potato wedges. A perfect party snack.